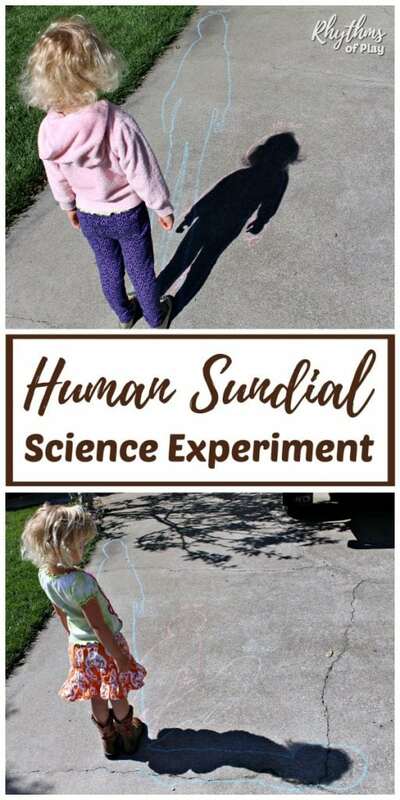 This human sundial shadow science experiment is a hands-on way for kids to learn about how shadows are created and measure the earth’s rotation. Most children think that the sun moves across our sky throughout the day. Conducting this outdoor science experiment helps children understand that it is actually the Earth that is rotating! I will never forget what I learned as a result of a human sundial experiment I did when I was a kid. I can remember staying after school that day to admire the beautiful human sundial tracings that we made in an attempt to make sense of it all. That’s the power of hands-on learning activities for kids! Making a human sundial is one of my favorite science experiments. I can remember making human sundials with my friends when I was in school. We all marched out to the playground together to trace our shadows and record our observations in our science notebooks several times that day. Everyone was assigned a partner and we each designated one person as the tracer, and the other as the trace. We worked together in pairs to record our observations and answer the questions our teacher asked us. We had so much fun I will never forget that day or what I learned as a result. I was so excited to share it with my daughter I decided to try it with her one day. Open space with no shadows and no clouds overhead. Driveways, parking lots, and playgrounds work well. Step 1 – Choose a sunny day when no clouds, rain, or snow is expected. It is not possible to trace shadows all day unless it is sunny all day. If clouds move in during the day you will have to scrap your human sundial shadow science for another day. Step 2 – Find an open cement or asphalt area near your home where the sun shines all day to make a human sundial. Find a wide-open spot that will be sunny all day. Driveways, parking lots, and playgrounds usually work well. Make sure you have enough space in all directions around you, shadows can grow long, and houses often cover driveways like ours did. If there are trees or structures near the area you are considering, check the area in the morning, at mid-day, and in the evening to make sure that the area is not shadowed at any time of the day. 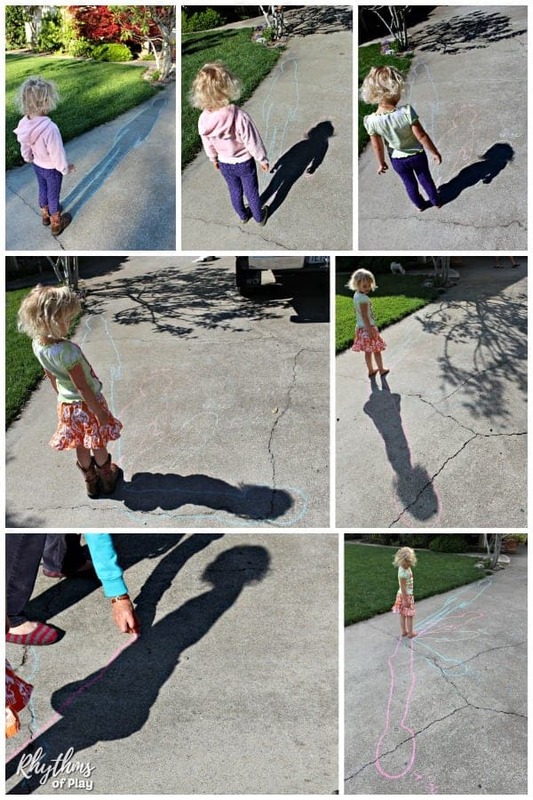 You need the sun on it to be able to trace your child’s shadow! If you are doing this with a class split them up in pairs and make sure the children are spread far enough apart to make their human sundials. You will need about 20-30 feet between each pair of students. Another option is to make one sundial with the whole class. Make sure you trace the same person throughout the day if you choose this option. Step 3 – Place an ‘X’ on the spot that your child will stand each time they have their shadow traced. Place an ‘X’ on the spot that you want your child to stand, or find some other way to mark the area in a way that will last all day. 4. 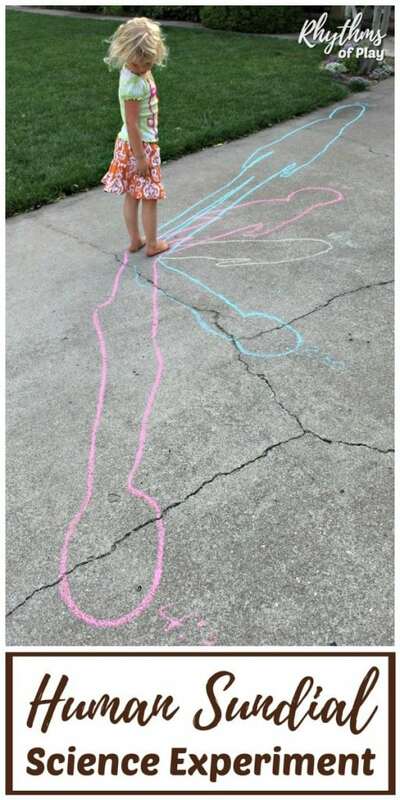 Use sidewalk chalk to trace your child’s shadow at least 3 times throughout the day. If you are working with a class have them trace each other’s shadows. Morning, mid-day, and late afternoon/early evening work great. Think of mealtimes as your cue to trace shadows, or set an alarm to go off. We did our shadow tracings every two hours at 8:30 am, 10:30 am, 12:30 pm, 2:30 pm, and 4:30 pm. 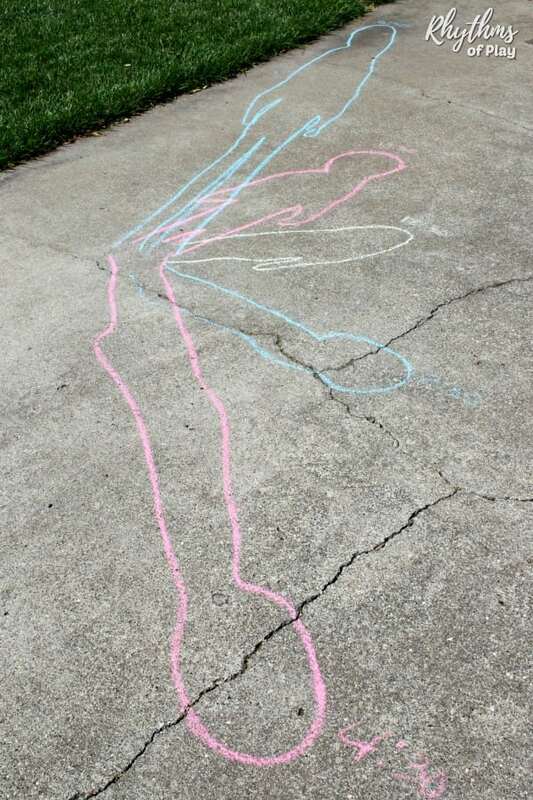 Use sidewalk chalk to note the time of day that it was taken next to each tracing. Have children describe their shadows each time the take it. (long and skinny, short and fat, etc.) Have them record this observation in their notebook. Note the general location of the sun in the sky in your notebook when you make each tracing. Measure the length of your child’s shadow each time you trace it and record it in your notebook. Ask your children to predict where their shadow will be and what it will look like at the next tracing time. Step 5 – Invite children to compare observations and formulate a hypothesis. Use this activity as a platform to discuss why the shadow changes throughout the day and throughout the rest of the year. Ask your kids the questions below to get them thinking. Later you can explain that our earth spins on its axis in a day and makes its way around the sun in a year to produce the changes that we see in our shadows. To extend this human sundial science activity conduct the experiment on or close to the summer solstice, fall equinox, winter solstice and spring equinox and record the differences. Taking photographs and recording your observations in a scientific notebook is a good way to keep track of the differences throughout the year. How do you think shadows are made? What did you observe about your shadow and the sun? Did the sun move? If yes, which direction? In what direction did your shadow move? Are the tracings the same? Why or why not? When was your shadow the longest? When was it the shortest? Why do you think that your shadow changes throughout the day? Do you think that your shadow also changes throughout the year? I had a hard time finding a space in our driveway that would work for this experiment. Shadows fall all over our driveway throughout the day, so I watched the sun for a few days to find a spot that would work. We did our shadow tracings at 8:30 am, 10:30 am, 12:30 am, 2:30 pm, and 4:30 pm in the spring. We would have done one last one at 6:30 pm if our house did not completely shadow our driveway at that time. You can see my daughter standing in her sundial at 6:30 pm in the bottom right photo in the photo collage below. She and our sundial are in the shade because our house had eclipsed the sun by that time. I love our photographs because they not only document the changes in her shadow but the changes in my daughter’s wardrobe throughout the day-ha! Those preschoolers are funny, aren’t they? 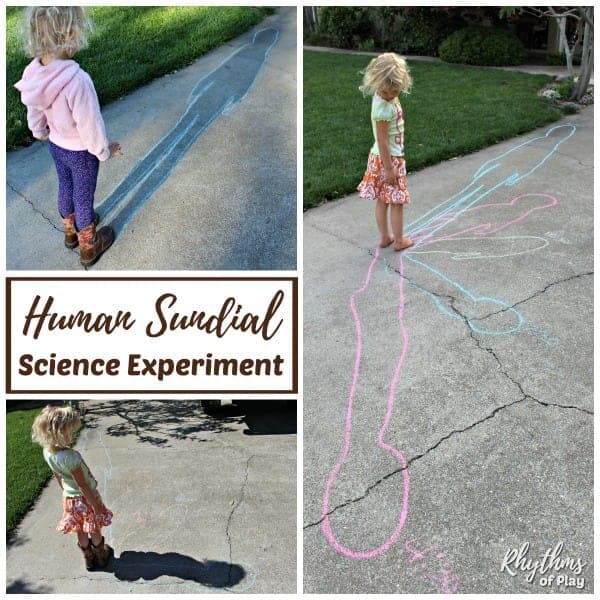 Help your children learn about the rotation of the earth by tracing shadows throughout the day with this human sundial shadow science experiment. An easy hands-on way for kids to learn about how shadows are created and measure the earth’s rotation. My daughter was only 3 when we tried this for the first time. She was too young to do some of the steps such as recording her observations in a science notebook so I asked her questions and wrote down her responses. The questions I asked dovetailed off her responses and lead her to the conclusion that we (Planet Earth) is rotating to produce the changes in our shadows throughout the day. Since that day we have continued to talk about how the earth rotates to make day and night. I have also begun to teach her how to tell time and what that means as it relates to the sun and the earth. If you are looking for more outdoor science activities you may want to try shadow art, rock balancing, or rainbow rainy day art! If you have a budding naturalist at home check out our top 10 Nature Study Supplies. This post is a part of the 31 Days of Outdoor STEM hosted by Little Bins for Little Hands. Be sure you head over there to see all of the other fun activities you can try! For more ways to have fun with shadows click on the link. Learn more about Rhythms of Play HERE.